– Correction of logs erasing. – Correction of preparations erasing. – Correction of preparations importing. – Correction of contacts erasing. – Correction of the menus. 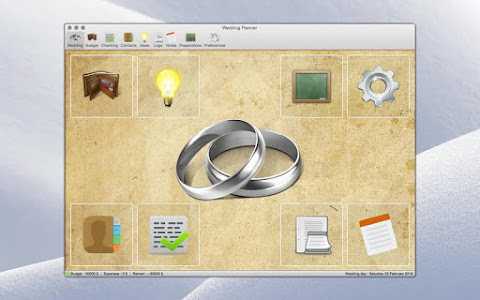 Wedding Planner 1.0.8 is available in the Mac App Store. Wedding planner helps you prepare your wedding with ease. Record your activities and plan your budget easily. Store your ideas, your notes, your links. 1) Wedding Planner is 1.99$, available on Mac App Store. 2) Wedding Planner is for Mac OSX. 3) Wedding Planner is easy to use.